The cross is a symbol for most of us that represents strength, faith, empathy, and everything that keeps us grounded as an individual. 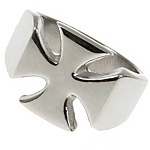 If you’re looking to find a beautiful piece of jewelry that includes a crucifix, look no further than our selection of men’s cross rings. We have a fantastic variety that includes many top styles, made from the most trusted materials in the industry. 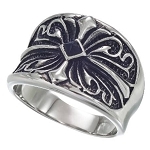 We have stunning rings available in silver, black, and gold. 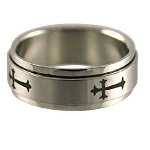 You can wear the crucifix proudly every single day by wearing one of our men’s cross rings. Whether you’re looking for a classic design, or something new and edgy, we’ve got you covered. 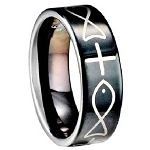 These rings are all durable, affordable, and act as a great reminder of your faith. Our options are made from stainless steel, titanium, and tungsten. No matter what size you are, we have a huge inventory to suit your needs. We will have your ideal choice, in the size that fits you perfectly. 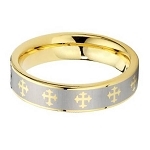 If you’re looking to add more spirituality or religious symbolism into your life, a cross ring is a great addition. An item from our selection can become very meaningful to you. You can wear it every day with pride. Whether you generally prefer classic or creative styles, we have a great mix of both. The way you dress and the jewelry or accessories you wear really says a lot about your personality. 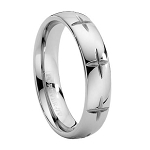 So make it authentic and true to yourself by purchasing from us here at JustMensRings.com. We have many quality choices that look and feel great but are also affordable. Think you may be interested in one? Evaluate all of our options and find one you love!